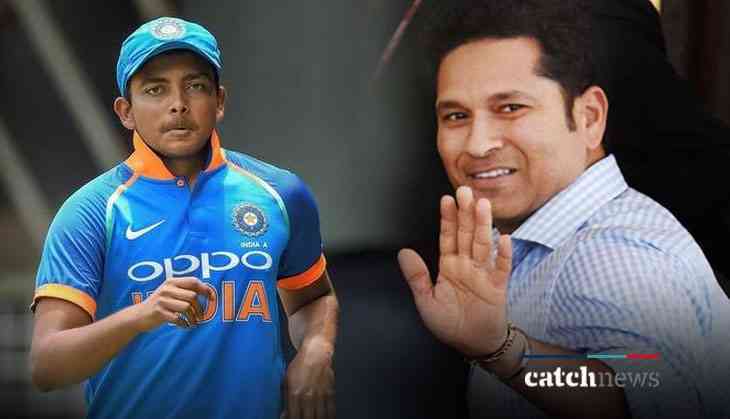 Indian cricket icon Sachin Tendulkar had a very special message for the Indian teenage sensation Prithvi Shaw after he recieved his maiden Test call-up for the Indian squad. Prithvi Shaw has a number of feathers to his glittering caps. From breaking school records at a very young age to skipping India U-19 to a World Cup win in New Zealand. Indian legendary batsman Sachin Tendulkar himself was a child prodigy and he told a eight-year-old Prithvi that no coach should change his natural technique. Indian batting maestro Sachin Tendulkar cited on his app '100MB' that "I asked him not to change his grip or stance, irrespective of any future instructions from his coaches. If anyone asks you to do so, tell them to come talk to me. Coaching is good, but overcooking a player with tweaks is not" as quoted in India Today. "It is so important not to change anything when you see such a special player. It is God's gift to have a complete package," Tendulkar added. "Around ten years ago, one of my friends asked me to take a look at the young Prithvi. He asked me analyse his game and give him some advice. I had a session with him and gave couple of pointers on how to improve his game," Tendulkar said.